It’s February, the birthday month. I don’t really do a lot to celebrate, I don’t have parties or anything, don’t really have enough of a social circle for the sort of nights out I used to have when I was younger, now it’s more a quiet meal with the family, a pint of beer and some cheesecake. 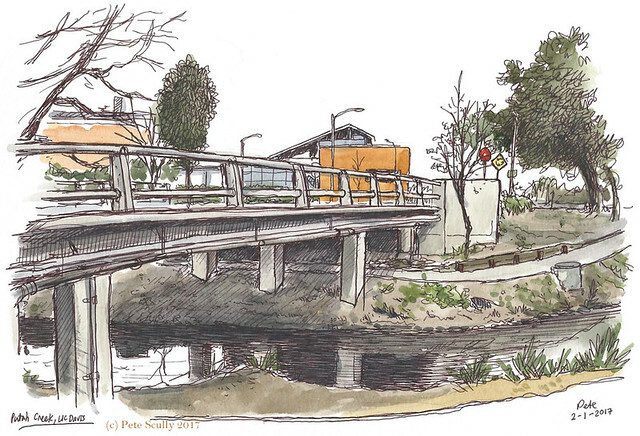 Now this sketch, done on the first day of the month at the UCD Arboretum about a minute from my office, was not meant to be metaphorical of birthdays but in that great way you can retrospectively attach meaning to anything, this is a bridge, signifying crossing from one time to another. Weak I know. On the far side though is the Robert Mondavi Institute of Food and Wine Sciences, which includes the Beer lab, so I supposed that signifies celebratory tipples in some way. There is a STOP sign, which must mean I need to stop and assess myself, and there is a yellow sign for a roundabout, which of course as we all know signifies the Circle of Life, obviously, that one’s obvious. The path, well part of it falls into shadow which of course means the path is not always clear, and then of course there is the Creek, and that one is easy, it signifies my creaking body as I get older each day. I had no idea there was so much semiotic depth to my sketches! I wonder what all the fire hydrants mean? Actually don’t answer that. Really nice water reflections. . . ah, another metaphor! Introspection, etc. Every sketch is probably a metaphor for something!